Often, the homeless are categorized as “other” in the eyes of the public and seen as undeserving of help. Some say that those who make poor personal choices, such as substance abuse, deserve to be homeless because they are incapable of making good decisions for themselves (Mitchell, 1985). It has been said that the ordinances of Cape Town infer that homelessness is caused by a moral failure on the part of the street people themselves (Du Toit, 2010). Virginia Werner had this to say after speaking with members of the homeless community in Kirkland, Washington on a project: “They recognize how the rest of society relegates them to non-personhood simply because they do not have a home […] homelessness is a multifaceted problem, and factors beyond one’s control often dictate circumstances” (Werner, 2014). The homeless are a vulnerable population and a country’s treatment of them is indicative of the social values and laws of that culture (Hellengers, 2011). Consequently, cultural anthropologist, Anthony Marcus, refers to the homeless as “social barometers” (Werner, 2014). The many influences behind becoming a street person have inspired many views on providing aid. 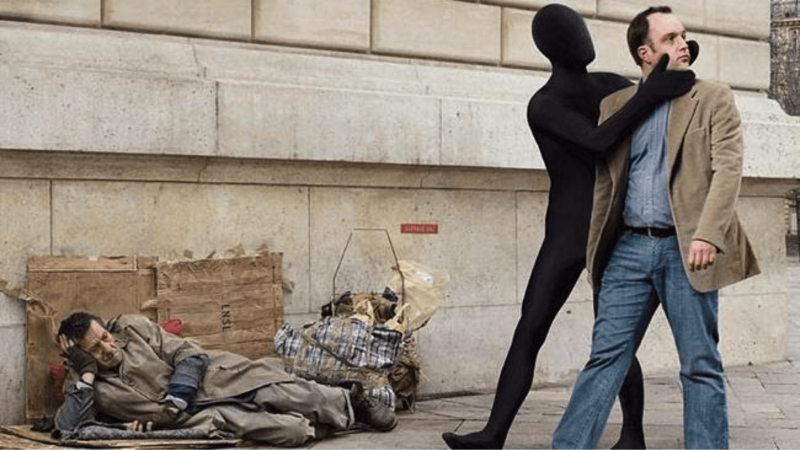 Gregg Barak, author of Gimme Shelter, explains different views on helping the homeless. The first debate is that only the minimal aid necessary for survival should be provided by the government to the homeless; any other aid would only encourage people to remain on the streets (Barak, 1991). Another argument is that no help should be given, stating that people are only begging, drawing from society rather than contributing to it, claiming help based on “so-called human rights” (Barak, 1991). There is a counter argument that suggests people should have the freedom to live as they desire. However, this perspective does not acknowledge that there are those who do not choose to live on the street (Werner, 2014; Barak, 1991). Barak offers a nuanced position suggesting that, “there are people who are homeless involuntarily and there are people who choose to live an alternative lifestyle – the former deserves aid as a moral obligation, and the “freely marginal should be allowed a place to exist” (Werner, 2014). Regardless of the position offered on how best to provide for the homeless, all recognize that those living on the streets depend on the generosity of the greater community to survive whether it is needed, warranted, or desired. Performing generous acts with the goal of benefitting others is classified as prosocial behavior (Hinde and Groebel, 1991). People are inclined to help those in need and are motivated to do so by how deserving the recipient of the aid seems to be and how similar they are to the giver, allowing them to empathize. Feeling a sense of responsibility to help others can motivate those who wish to prevent feelings of guilt that would result from doing nothing (Dovidio et al. 2006). However, one of the strongest motivations is self-interested justification. When the giver can see that they have something to gain by providing aid to another, it increases the likelihood of an individual choosing to help (Holmes, Miller and Lerner 2002; Perlow and Weeks 2002). The individuals receiving aid can have emotional responses that are both positive and negative. A negative response would include feelings of being deficient because accepting generosity implies that help was in fact necessary (Collet and Morrissey, 2007). The aid provided to the street community in Khulisa’s pilot work program was not strictly giving. When they provided job opportunities and created an environment of acceptance, they allowed the street people to engage in self-support. This type of charity produces more positive responses and boosts the self-esteem of those receiving help (Dovidio et al. 2006). Our project was intended to offer similar support and inspire the street people to engage in a project for their own benefit. Barak, Gregg. (1991) Gimme Shelter: A Social History of Homelessness in Contemporary America. New York: Praeger. Collett, J. L., & Morrissey, C. A. (2007). The social psychology of generosity: The state of current interdisciplinary research. Report for the John Templeton Foundation Generosity Planning Project.–45 p, 15, 2008-09. Du Toit, J. L. (2010). Local metropolitan government responses to homelessness in South Africa. Development Southern Africa, 27(1), 111-128. Hellegers, Desiree. (2011) No Room of Her Own: Women’s Stories of Homelessness, Life, Death, and Resistance. New York: Palgrave Macmillan. Hinde, Robert A. and Jo Groebel. 1991. Cooperation and Prosocial Behavior. New York, NY: Cambridge University Press. Holmes, John G., Dale T. Miller, and Melvin J. Lerner. 2002. “Committing Altruism Under the Cloak of Self-Interest: The Exchange Fiction.” Journal of Experimental Social Psychology 38:144-151. Lemoigne, J. (2015). Turning away from the homeless. Werner, Virginia C., (2014) Planning for Self-Organized Homeless Camps: Policy, Community Relations, and Locational Process. University of Washington.